The Battalion is one of the four schools that became a Snapchat Campus Publisher in August 2017. I wanted to know: what goes into producing an effective Snapchat story? I talked to the team behind The Battalion’s: Social Media Editors Katy Baldock and Sarah East, who are in charge of The Battalion’s first-ever social media desk. Before partnering with Snap, The Battalion managed a regular snap account for live coverage of sport events and other light stories. When the Battalion’s editors were approached by Snapchat and signed the content deal, they recruited Katy from the yearbook staff and Sarah from page design to co-lead the new “social media desk” and lead the Snapchat project. “That was the cool part. We kind of got to start from the beginning,” said Sarah. Katy and Sarah worked with three of Snapchat’s Campus Outreach staff members via video calls and emails throughout summer 2017. The Snapchat staff, who they worked with on a first-name basis, provided training on their ‘Story Builder’ software and gave feedback on animations, design, content, and readability. It took three weeks to create 12 panels for the first Snapchat story. Now, they produce an 8-12 panel story every week. They continue to meet with Snapchat every three weeks. “I think the amount of planning for that first snap definitely prepared us in producing the ones after that,” said Katy. Content suggestions for Snapchat can come from any desk in production meetings, especially from the sports desk, but ultimately Katy and Sarah are the ones creating the content. Katy and Sarah have also gathered inspiration from engaging, animation-heavy Snapchat stories like BuzzFeed’s, and from other campus publisher stories like those at The Daily Californian and The Badger-Herald (though they haven’t directly collaborated). Katy and Sarah require two pitches from each producer and animator on their team at budget meetings. They assign stories two weeks in advance. Ideally Katy and Sarah would manage a social media reporter from each desk, but are waiting until Snapchat production stabilizes. “It’s been cool to collaborate cross-desks in different ways, and cover alternative coverage so it’s not just written stories all the time. I think it’s a really cool way to engage our student body,” Sarah said. The Snapchat team uses Adobe Premier and After-Effects for animation and a Snapchat-specific program called the Story Builder, or Publisher, for building the final, published product. They’re also given a custom app to preview the stories before they’re published on Snapchat. “We’ll build the snaps, and then once they’re all in [the Builder], we can edit the order of them and then choose the title photo and caption: one of our best snaps for that week to get people interested in reading it. And then we have our ‘subscribe’ snap at the end,” added Katy. The Battalion’s Snapchat story delivers light-hearted, “fun” feature content centered on student and campus life. “I think it’s a good way to incorporate new kinds of coverage to re-engage readership,” added Sarah. 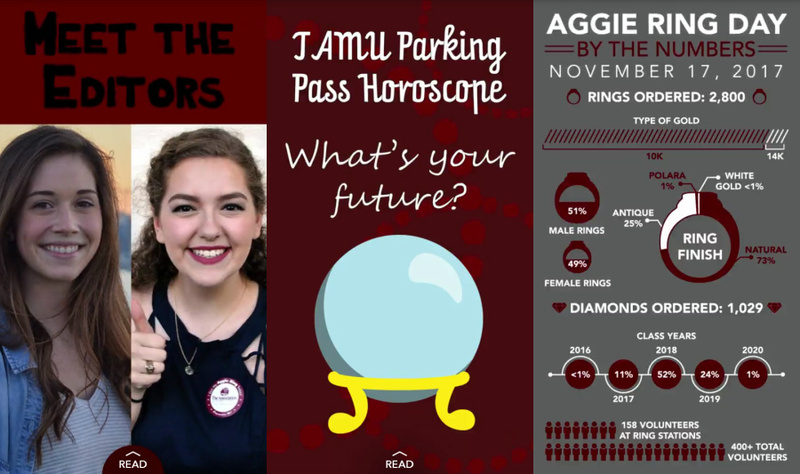 The pair has found that culture-specific content for Texas A&M is the most popular, especially stories with humor. Graphics for their story on “How to Yell,” for example, got a lot of screenshots. One example of a popular snap was a “food battle” between a local chain “Lane’s” and national chain “Cane’s.” Another was a Parking Pass Horoscope, where a writer spoofed a horoscope format to “make a joke about the terrible parking situation and how much we pay for parking.” They’ve also asked college seniors to find certain buildings on campus, following to watch them fail. “I think all the ones that have done well are things that are really relatable to students on campus, that if someone who wasn’t here that was watching it [wouldn’t get],” said Katy. The Battalion’s snaps are visually engaging. Sarah described their use of graphics and GIFs as “BuzzFeed-y.” Video has proven to be the most engaging out of all their formats. “Our analytics have shown that people will watch the videos more than they’ll read the articles,” said Katy. Shorter content, like brief articles and listicles, also tend to draw higher engagement. They keep ”top snaps” minimalistic and short to entice readers to swipe up and read the rest of the story, or watch the attached video. “[We learned] how to condense our information, making it adjustable, and then breaking it up with pictures and other media to keep people scrolling,” said Sarah. Katy and Sarah noted that it has been interesting to see where their snap audience (8.5 thousand at the time of our interview) spends their time, which snaps do and don’t do well, and the demographics of their viewers. My last question for Katy and Sarah was: should other papers publish stories on Snap? Their answer was, yes, if you have the resources and the staff. “It is a lot of work and requires a lot of planning and organization. I definitely would recommend having a good staff established before you start it. But if you have the resources, you have the people, it’s definitely something that I would recommend newspaper do,” said Katy.